When contemplating the history of the artists and events of the fifteenth and sixteenth centuries, it is sometimes easy to become absorbed in the wondrous images of the period. In seeking a deeper understanding of era and the people who created and viewed these works, primary sources can also give us a link to the past. Such records are often mundane, like receipts for financial transactions ; at other times they are more intimate - such as personal correspondence, even sketches and doodles scribbled on a scrap of paper that give us insight into the thoughts of a person long passed. Sometimes, even snippets of information become crucial pieces of evidence in a grander case, such as the inscription describing Leonardo working on a portrait of "Lisa del giocondo", scrawled by Agostino Vespucci in his personal copy of Cicero's Epistolae ad familiares. This short marginalia is regarded as a crucial piece of evidence in establishing the identity of the sitter in Leonardo's famous Mona Lisa. In a copy of a 1477 edition of Cicero, Agostino Vespucci lauds Leonardo as the new Apelles, and notes Leonardo is working on a portrait of Lisa del Giocondo. This inscription was discovered in 2005 by Dr. Armin Schlecter. Recently, I was seeking references explaining why Botticelli is often thought to have thrown paintings into the bonfire(s) of the vanities organised by Savonarola and his followers. This was in the context of my review of an episode of The Borgias that aired in June 2012, where this scene was represented as a concrete event. Botticelli leads his painting to the fire in The Borgias episode, The Siege at Forli. It quickly became apparent there was no first-hand record of Botticelli throwing his works into a fire. What we had instead was a series of varied accounts that fostered the assumption this may have happened. Over time, this supposition seems to have become a popular myth of the Renaissance. Records of Savonarola's sermons against impious depictions of the Virgin and the saints. Savonarola was not entirely against images, but did seem to take offence at depictions of holy figures that were too infused with aesthetic consideration. These descriptions come from Simone's Chronicle of events between 1489 and 1503 which survive only in extracts and secondary accounts. 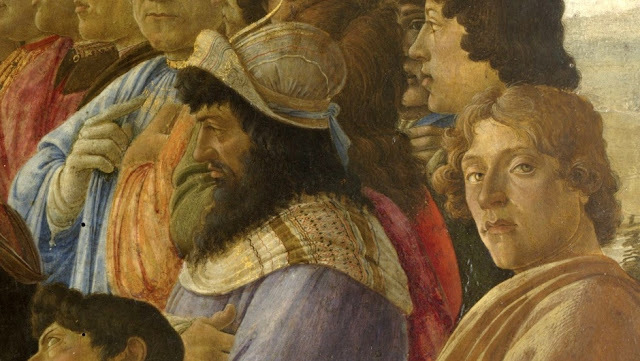 These take us a little closer to a firmer link between Botticelli and Savonarola, but are still ambiguous enough to make the association between the painter and friar uncertain. Lorenzo Violi, in his Giornate or Book of Days (sixteenth century), writes that Simone Filipepi was often present in Sandro Botticelli’s workshop for meetings and discussions between the supporters and the opponents of Savonarola and that he recorded many of those discourses in his Chronicle. Violi adds that he read Simone Filipepi’s book and that it was bound in boards. FILIPEPI, Simone. - Born in Florence around 1443, in the quarter of Santa Maria Novella, in the gonfalone of the Unicorn, son of Mariano son of Vanni and of Smeralda. The date of birth is derived from a tax declaration from February of 1458, in which it emerges that he was 14 years old. Simone Filipepi’s father Mariano, born around 1396, came from a modest family of galigai, [that is to say leather dressers], an activity which he himself exercised together with his brother in a rented shop near the Santissima Trinità bridge. Mariano, his father had eight other children, including Sandro, who is usually known as Botticelli. While the older brothers Giovanni undertook the trade of agent at the Monte [i.e. a government sponsored investment fund] and Antonio the trade of goldsmith, Simone Filipepi was sent to Naples in the service of Paolo son of Paolo son of Bingeri Rucellai, who was the proprietor of an important business enterprise. After the death of Rucellai, which took place in August of 1458, Simone Filipepi perhaps moved to Rome. Simone Filipepi’s Chronicle, which covers the years from 1489 to 1509, constitutes the principal biographical source for him. In it, he declares that he lived in Rome for about twenty years, involved in important commercial activities. Since it emerges that he was in Naples in 1480 (as attested by his brother Giovanni’s tax declaration for that year), then was again in Naples in 1488 and 1493, his long stay in Rome must have taken place between the end of 1458 and 1478. In 1482, Simone Filipepi was certainly to be found in Rome at the Papal Court, since he wrote from there to his brother Giovanni in Florence on 16 August. Writing from Naples on 19 April 1488 to Lorenzo dei Medici in Florence, Simone Filipepi refers to his previous correspondence with the Magnifico and informs him that he enjoys respect at the Aragonese court while serving the Aragonese merchant Raimondo. In addition, he refers to matters of mutual interest, involving other figures in the world of commerce, including Nofri Tornabuoni, then director of the Medici branch office in Rome, and Francesco Nacci. In closing, Simone Filipepi commends his brother Giovanni, in view of the favor which the Magnifico has shown their family. Simone Filipepi’s stay in Naples lasted until 1493. He states this himself in his Chronicle, where he talks at length of his relations that year with the ambassador of the Sultan of Egypt who was passing through Naples and heading to Rome. Simone Filipepi intervened with King Ferdinando I on behalf of the ambassador, hoping to resolve some affairs that were pending in Naples, thereby bringing to a successful conclusion an important business transaction involving Simone Filipepi’s company and the Sultan of Egypt. He even accompanied the ambassador on his trip to Rome, escorting him as far as Fondi. At the beginning of 1494, Simone Filipepi must have returned to Florence, thereby starting another protracted phase in his life. In fact, he joined the movement of Girolamo Savonarola, who inspired the government that was established at the end of 1494 after the fall of the Medici regime. From the Chronicle, we know that Simone Filipepi frequented the Convent of San Marco, the spiritual and political center of this movement. He was a strenuous defender of the frate and a signatory, along with more than 300 other citizens, of a petition sent to Pope Alexander VI, requesting the annulment of Savonarola’s excommunication, which was published in Florence on 18 June 1497. After the arrest of Savonarola on the night between the 8th and 9th of April 1498, Simone Filipepi courageously went to ask for news from the guardian who had the frate in custody. He was also a witness to an episode of torture in the presence of Savonarola. 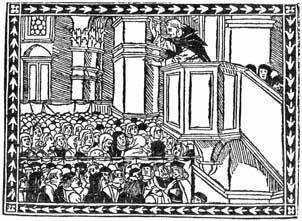 Simone Filipepi acquired the printed text of the false trial of the frate, which was read in public on 19 April 1498, and when the Signoria ordered him to return this text, he did not obey. This was also the case regarding the small red crosses that the piagnoni [i.e. “wailers”, supporters of Savonarola] carried in their hands in their processions, which he was supposed to give back to the Archbishop’s vicar on pain of excommunication. 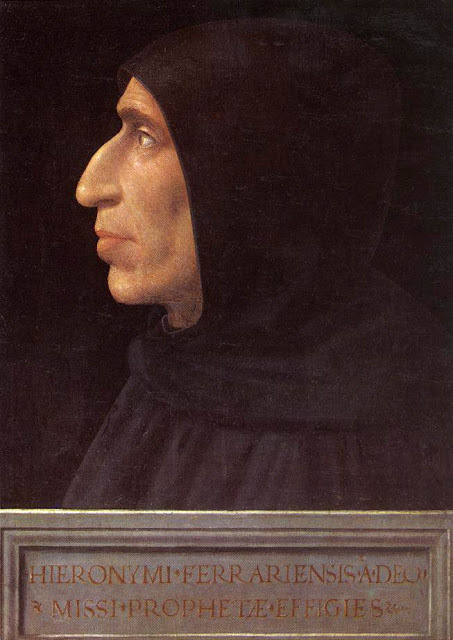 The persecution unleashed against Savonarola’s followers after his death forced many of them, including Simone Filipepi, to leave Florence. However, it is not clear whether the flight of Simone Filipepi—who took refuge in Bologna, together with various friends—occurred before or after the death of the frate (23 May 1498). In 1503, it emerges that he had returned to Florence. He died there on 12 June 1512 and was buried in his family tomb in the church of Ognissanti. We have no information regarding the cultural formation of Simone Filipepi. Although he was experienced in business practices, he was occupied primarily with religious and spiritual problems after his return to Florence and his adhesion to the Savonarolan movement. He cultivated the reading and study of Dante, perhaps through the influence of his brother Alessandro [i.e. the painter Botticelli]. This interest is demonstrated by the note of ownership in a codex that belonged to Simone Filipepi (now preserved in the Biblioteca Nazionale in Florence, Magl. VII, 1152), containing an anonymous commentary, in a theological key, to the Dantesque song, “Tre donne intorno al cor mi son venute (Three Women Have Come to Surround My Heart)”, dedicated to Benedetto Manetti. The inscription of ownership bears the date "1495" and the number "XXXI", demonstrating that Simone Filipepi had a considerable library. Simone Filipepi is the author of a Chronicle of the events that took place between 1489 and 1503—and 1503 would seem to be the year when he began composing it, considering the reference to a discussion regarding Savonarola that he had with Doffo Spini and Bartolomeo Carducci on 9 April 1503, while leaving his house to go to Vespers at San Marco. There are also references to Pier Soderini’s position as Gonfaloniere in 1502 and the death of Alexander VI, which took place on 19 August 1503. The original text of the Chronicle has not come down to us while only an extract has survived in a codex of the 17th Century containing various texts regarding Savonarola. This manuscript, discovered at the end of the 19th century, is preserved in the Archivio Segreto Vaticano, with the shelf number Politicorum XLII; the extract of the Chronicle begins on on foglio 338 (the text was edited by P. Villari-E. Casanova, in Scelta di prediche e scritti di fra Girolamo Savonarola/Selection of Preachings and Writings of Fra Girolamo Savonarola, Firenze 1898, pp. VIII-XI, 453-518). Lorenzo Violi, in his Giornate/Book of Days (XVIth Century), writes that Simone Filipepi was often present in Sandro Botticelli’s workshop for meetings and discussions between the supporters and the opponents of Savonarola and that Simone recorded many of those discourses in his Chronicle. Violi adds that he read Simone Filipepi’s book and that it was bound in boards. In some cases, the anonymous compiler of the extract of the Chronicle reproduced passages of the original while in others he made a summary, without however following a rigorous chronological order. The material is divided into two distinct sections with two different titles, even if they both begin with the arrival of Savonarola in Florence in 1489 and end with the death of Alexander VI. The first section, titled "Alcune memorie notabili di fra Girolamo Savonarola/Some Notable Memories of Fra Girolamo Savonarola from Ferrara", regards the general history of the time. The second, titled "Nota di alcuni particolari pertinenti al padre fra Girolamo Savonarola da Ferrara/A List of Some Particulars Relevant to Fra Girolamo Savonarola from Ferrara", consists entirely of notices regarding the life and preaching of Savonarola in Florence and regarding his followers—in large part the fruit of the personal experiences of Simone Filipepi. The chief value of Simone Filipepi’s work lies in the account of the vicissitudes of Savonarola, recording the daily evolution of events—although this is admittedly a partisan interpretation. The account of the trial and final ordeal of the frate is particularly ample, as is that of the subsequent persecution of the piagnoni, which resulted in the exile of many of them. Great attention is given to the defusion of Savonarola’s religious teaching in Florence after his death and the opposition which it encountered. In the Chronicle, among other things, all of the frate’s detractors are listed—including political figures and rulers—emphasizing their inglorious deaths, as if these were posthumous vindications. Simone Filipepi also writes that he has composed another “book”, containing a transcription of the letters of the Vallombrosan monk Angelo, Savonarola’s adversary, who was the author of many prophecies against the pope, the emperor and other men of power. However, no action was ever taken against him, unlike the case of Savonarola. This work appears to be lost. Arch. di Stato di Firenze, Catasto, 75, c. 353v; 404, c; 487v; 457, c. 160r; 619 bis, c. 767r; 814, cc. 344r-345v; 1010, cc. 244r-245r; Ibid., Decima repubblicana, 20, c. 75r; Ibid., Mediceo avanti il Principato, XL,251; Ibid., Notarile antecosimiano, 9657, c. 97rv; Ibid., Ufficiali della Grascia, 191, c. 30v; Ibid., Manoscritti, 625, p. 910, n. 103; 471, c. 101r; Ibid., Ceramelli Papiani, 2020; Firenze, Bibl. naz., Conventi soppressi, G.2.1501, f. 115; Magl. VII, 1152; L. Violi, Le Giornate [sec. XVI], a cura di G. C. Garfagnini, Firenze 1986, ad Indicem; P.Villari, La storia di Girolamo Savonarola e de' suoi tempi, Firenze 1887, I, pp. LXXIV, 489; II, pp. 142, LXXIV, CXIV, CXVII; G. Gamba, Botticelli, Milano 1936, pp. 173 s., 176 s.; D. Weinstein, Savonarola e Firenze, Bologna 1976, p; 393 n. 3; G. M. Anselmi-F. Pezzarossa-L. Avellini, La "memoria" dei mercatores. Tendenze ideologiche, ricordanze, artigianato in versi nella Firenze del Quattrocento, Bologna 1980, p. 118; R. Ridolfi, La Vita di G. Savonarola, Firenze 198 1, p. 486; H. P. Horne, A. Filipepi, detto Sandro Botticelli, pittore in Firenze, Firenze 1986, ad Indicem;F. Cordero, Savonarola agonista perdente. 1497-1498, Bari 1988, ad Indicem; L. Polizzotto, The elect nation. The savonarolian movement in Florence. 1494-1545, Oxford 1994, p. 152 n.